Otoplasty is a relatively less invasive cosmetic surgery procedure, but it will still involve certain risks and complications that are associated with any surgery. The decision to undergo ear surgery is a very personal one, and the patient should assess the potential benefits and decide whether the potential risks and complications are acceptable. The surgeon will discuss about the risks of ear surgery during the initial consultation and help the patient make a well-considered decision. The patient will be required to sign consent forms to ensure that they have fully understood the procedure, the alternative treatments available, if any, and the potential risks and complications. Patients should be prepared to diligently follow the surgeon’s instructions from the pre-operative preparation stage to recovery in order to mitigate the risks. 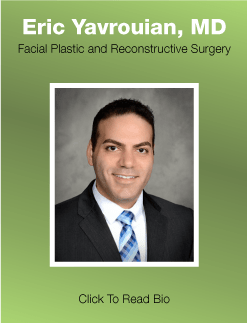 Facial plastic and reconstructive surgeon Dr. Eric Yavrouian provides ear surgery to patients in Glendale, Pasadena, Burbank, Greater Los Angeles, Beverly Hills, CA, and surrounding communities. In rare cases, bleeding may occur during the ear cosmetic surgery or during the recovery. This risk can be avoided by carefully evaluating the patient’s existing health condition, and stopping certain medications and herbal supplements that can increase the risk of bleeding. This is another rare risk associated with ear surgery. Patients who have a history of clotting are more prone to this risk. The surgeon should review their medical history thoroughly and the patient should be prepared to disclose all health-related information for their own safety. Whether otoplasty is performed in one or both ears, it may result in asymmetry in a few cases. Patients should choose a skilled and experienced facial plastic and reconstructive surgeon to minimize such risks. Infection risks are common to any surgical procedure. A proper sterile environment should be maintained during the surgery, and the patient should avoid any exposure of the incisions to dirt or dust in the early healing stage after the surgery. Antibiotics may be prescribed for a few days to minimize the risk of infection after the surgery. Poor wound healing may occur in a few cases, or the healing may be very slow and delayed. Patients who smoke are more at the risk of delayed healing because nicotine in tobacco will interfere with the blood flow. The surgeon will advise the patient to refrain from smoking for a certain period of time before and after the surgery. For children, the ear surgery procedure will be performed using general anesthesia. In a few cases, the patient may have an adverse reaction to anesthesia. An anesthesiologist or certified nurse anesthetist should be present who can monitor the condition and identify any problem early. Changes in skin sensation or numbness, skin discoloration, prolonged swelling, unfavorable scarring, allergies to suture materials and tape, persistent pain, and possibility of revision surgery are other risks that should be taken into account. Dr. Yavrouian receives patients from Glendale, Pasadena, Burbank, Greater Los Angeles, Beverly Hills, CA, and nearby areas for ear surgery.